Wire ropes are one of the most commonly used materials in industrial and commercial facilities. These ropes typically comprise of several strands of metal wires that have been twisted into a helix pattern. 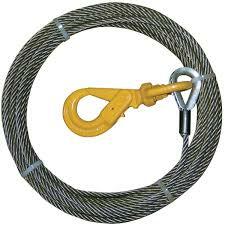 Also referred to as cables or cords, wire ropes are an absolute necessity in several sectors. Moreover, the importance of wire ropes can be gauged from the fact that almost every developing and developed nation has specific standards for these ropes that need to be conformed to. Although many metals can be used as the primary component in these ropes, the most widely used metal is steel. This is perhaps due to the fact that wire ropes made of steel are more reliable ( instances of steel wire ropes having mechanical failure are minimal). Wire ropes come in various dimensions, specifications and with innumerable features. Owing to the above mentioned fact about these wire ropes being used in several sectors , the differences in design and functionality of various wire ropes is also considerable. Some notable wire ropes are steel wire ropes, annealed wire, PVC coated iron wire, Gi binding wire, umbrella rib wire etc. Historical references suggest that the modern wire rope was invented in the 1830's. The credit for it's invention goes to German mining engineer Wilhelm Albert. Afterwards, the wire ropes quickly became the material of choice for use in mining sector because of their superiority to metal chains or to ropes made of hemps. Likewise in the other sectors too, these ropes gradually became popular. In 1840, Robert Stirling Newall further improved on the design of these ropes, making them ideally suited for use in innumerable sectors. All through out the 19th century, the ropes evolved greatly, with consistent improvements in their design through some dexterous professionals who did what the two aforementioned people did. Even today, wire rope manufacturers consistently endeavor to improve upon the design of these ropes.